Why are the people who run the Alaska Zoo allowing Maggie the elephant to die a slow, cruel and painful death? There are alternative placements for Maggie where she can go to live, be happy and lead a lot longer life than Alaska can provide her. I've been in Alaska for 30 years, and I remember how Annabelle died. I also remember how Binky and Nuka died. I question whether we're murdering Maggie by being selfish, by not letting her leave to live in a better habitat. Enough is enough. Let Maggie go, and let's quit thinking about ourselves. 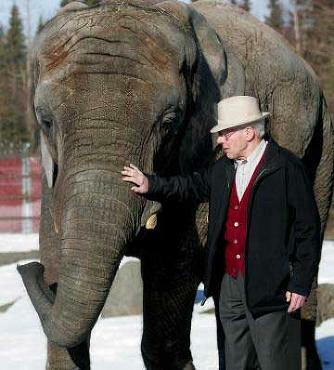 I have just read about the elephant Maggie, who is held prisoner in the Alaska Zoo. She is alone and cold and does not belong in Alaska's environment. Please see that she is transported to a refuge in a warm climate so that she may live out her life comfortably and in the company of other elephants. Her lonely existence is pitiful, and I cannot believe Alaskans can be this cruel. Please stand up and protect Maggie and get her to a warmer clime with her own kind. Keeping animals in cages is cruel. But a greater good can be had from zoos that promote learning about and protecting wildlife in substantial ways (not just talk). Zoos around the world have moved away from the old paradigm of keeping animals in cages merely to be looked at. Our zoo should work directly with UAA and others to promote, protect and display animals of the north. After only two months here, a camel died. If Maggie dies, alone, lying on that cold cement floor, the zoo management should be ashamed and held responsible for not doing the right thing and sending her someplace better suited. Her obvious discomfort should be a wake-up call, not just to help her but to turn the zoo into a center to promote understanding, habitat protection and endangered animal propagation way north of the equator. Education is a big task that would take big involvement and resources, but a worthy one that could pay us back in so many ways and give some meaningful justification for the confinement of those wild animals. Free Maggie now! Stop this cruel crime against nature before it's too late. I will pledge $1,000 to charter an air cargo plane to take Maggie home. Time is of the essence; we must act now. So the Alaska Zoo wants to wait until August to review Maggie's future. That will bring us very close to the end of tourist season. How convenient for the Alaska Zoo. August could be too late. If Maggie passes away before this review, her blood will be on the hands of every Alaskan. The elephant Maggie collapsed at the Alaska Zoo because her environment is not suitable or healthy for her. Elephants need a lot of room to roam. They cannot be kept in cramped indoor spaces; it's very bad for their feet, and they get diseased. Elephants are family-oriented animals. They require other elephants to interact with to be healthy. They need mud pods, lakes to swim in, acres of fields, trees, lots of grass and a warm climate. Maggie should go to the Elephant Sanctuary in Tennessee, like the Philadelphia Zoo's Asian elephant Dulary did. Dulary is flourishing there. The sanctuary has everything an elephant must have and when each elephant arrives it ends the cruel, oppressive, sad existence they had elsewhere. If you really love Maggie, you'll let her go. Don't wait until it's too late. Think about that, won't you please? It really hits me hard that Maggie the elephant has no elephant friend to keep her company. I think she needs to have a friend. I believe Maggie, the Alaska Zoo's lonely and uncomfortable elephant, deserves better. I think she should be transferred to an appropriate haven permitting social contact with her peers and living conditions free from the harsh conditions of her current situation. "Sometime late this month, a 42-year-old Asian elephant named Dulary will board a trailer bound for a 2,700-acre sanctuary in Hohenwald, Tenn., 85 miles southwest of Nashville. Animal advocates are delighted. Dulary's new digs are as good as it gets for an elephant in captivity, they say, and much better than living alone in a barn stall. ... Dulary's departure ... is part of a larger trend. Changing standards of care have prompted many zoos across the U.S., including Detroit, San Francisco, Chicago's Lincoln Park and New York City's Bronx, to close or phase out their elephant exhibits, citing insufficient funds to manage pachyderms and provide them with ample room to roam. (P)ublic outrage over cramped conditions and hard-surface floors, believed to cause arthritis and foot disease, has also played a role." It appears that Maggie the elephant has given up on her lonely, empty existence. She must realize that the effort to get up just isn't worth it anymore. It's just what the citizens of Anchorage need to watch: a pathetic elephant dying a slow, sad and lonely death. Way to go, Alaska Zoo! Poor Maggie! Before coming to Alaska in 1973, I spent several years in Rhodesia (Zimbabwe). Most of my time there was spent in the Bush, particularly along the Botswana border between Bulawayo and Victoria Falls. This area was well-known for its herds of elephants. I was fascinated by these creatures and spent untold hours observing them, naming them and taking pictures. The time I spent in the Wankie Game Reserve allows me to claim I've had more exposure to the big guys than anyone I've ever met in Alaska. So, although not an academic biologist, I think I do have some understanding of their character. I went to see Maggie last year to check her out. I was bummed out to see the most lifeless, depressed "dhlovu" I've ever encountered. It was like she was on Thorizine. I looked in her eyes and nobody was home. It was really unpleasant, and I fantasized that a group of big bulls would come to her rescue, breaking down the fence and escorting her to freedom. Again, I am no zoologist, but perhaps some of her current problems are due to depression. I read the report about Maggie, the elephant at the Alaska Zoo in Anchorage. I check the countdown clock every day at the Friends of Maggie Web site hoping that the right decision will be made so that she may improve her quality of life in a warmer climate with companion elephants and room to roam like her relatives in the wild. Maggie collapsed on May 13. There are 89-plus days left until a decision will be announced in August. I fear for her health and ability to travel if she is left in her present circumstances for that long. I realize that this is the tourist time for the zoo and losing her may affect zoo patronage, but a dead elephant will be worse. There are two sanctuaries that have publicly said that they would take Maggie at no charge to the zoo. The board of directors for the zoo should accelerate the decision timeline and make the right decision to let her go to a sanctuary before it is too late. Maggie the elephant should have moved to a sanctuary long ago. Now that her health problems are urgent, she needs to be moved as soon as possible. This week she has gone down twice. Two other elephants in recent memory had to be euthanized after they went down -- Gita at the Los Angeles Zoo and Lucy at the Milwaukee Zoo. At just 25 years of age, Maggie is still young enough to recover and live a full life if she moves to a sanctuary with acres of land to explore and other elephants to bond with. Elephants are a big draw to a zoo. However, Maggie cannot be a draw if she dies. Her death will simply prove that the zoo had no business keeping a tropical, sensitive, intelligent, social herd animal alone in a barn six months out of the year, knowing that in the wild elephants walk 30 miles per day. Move Maggie before it is too late. What will it take to get zoo to act? Could Maggie the elephant's story get any more heartbreaking ("Elephant ache draws attention from beyond Alaska," May 15)? First, the Alaska Zoo persists in keeping this social animal isolated and alone. Next, they build a treadmill to keep her "active" during the long winter months she's kept in a tiny indoor cage. Now, firefighters and winches are called in to haul a collapsed and ailing Maggie off the floor. What will it take for zoo officials to finally, mercifully, retire Maggie to sanctuary? How many more collapses will it take before the zoo realizes that Maggie's environment is killing her? I organized the local campaign here in Philadelphia to help the zoo elephants get out of their unhealthy environment. Thankfully, after a huge public outcry, the Philadelphia Zoo made the compassionate decision to send its lone Asian elephant to the Elephant Sanctuary in Tennessee, where she is thriving. The zoo is also going to send the other three elephants away and close the outdated exhibit -- something long overdue. Once the public was educated on the needs of elephants, which include other elephants for socializing, space for roaming, and live vegetation for diet, Philadelphia citizens rallied to support the departure of the elephants from the zoo here. Alaskans need to understand that every day Maggie spends in that cement cell is another nail in her coffin. Please, we beg you, demand that your zoo make the right decision and send Maggie away. Warm sanctuaries would welcome Maggie to live with other elephants Poor Maggie. Lying down and not getting up equals depression and pain. Cold steel bars, concrete floors and freezing temperatures for months at a time, these conditions cause crippling arthritis for an elephant and early death. Their feet are their lifeline; they must walk miles every day to retain their health. Maggie had her tusks cut back, the caretaker said, because she broke one off on the steel bars. That in itself is a wake-up call. The enclosed space was too small and her swaying in times of boredom caused them to break off on the steel bars. Annabelle died at the Alaska Zoo. How much longer will Maggie last? There are sanctuaries in the U.S.A. in warm climates with lakes to swim in, miles to roam, and her own kind for companionship. More and more zoos are retiring their elephant exhibits because studies show it is a slow, painful death to keep them confined in small areas. And no one ever proved a treadmill would save them! Please let Maggie go before she lies down and no one can get her up. While vets argue over Maggie's health, the obvious answer seems to elude them. Loneliness and depression are not a human monopoly, and Maggie's being away from her kind in a strange, cold land and tiny stall would do the same to a human taken from their own. Her sorrow is obvious. People for the Ethical Treatment of Animals and Friends of Animals are waiting in the wings for the biggest blow to Alaska's reputation and image Outside imaginable. The repercussions of Maggie's lonely and perhaps impending death will last for years, and affect the Iditarod, tourism and God knows what else. Let's get her to that elephant park in Tennessee or some such place, posthaste. I just hope she's well enough (psychologically) to survive the trip now. If we clone mammoths I'll have no problem with them being at the zoo, by the way, as long as they have room to stretch their hairy and northern climate-adapted legs. For pity's sake, send our pachyderm packing! If Maggie is going to lie down let it be on a grassy field with other elephants who probably know how to help each other up if necessary. I don't care what people say, seeing her in those conditions, miserable and sickly, should not bring anyone joy or entertainment or education. Let the zoo know we want Maggie happy and the webcam would be a fine alternative to keep tabs on her. If Maggie has 40 years of life ahead of her, which I doubt in these circumstances, then let her live them on one of the nice elephant reserves already waiting to take her. I can't believe you people are keeping an elephant up in Alaska. Could you be any more abusive? An elephant doesn't belong in a climate that it is not made to thrive in. The fact that the poor thing has to be enclosed during the cold months is completely inhumane. Honestly, I think the citizens of Alaska would not be hesitant to relocate Maggie to a more suitable environment if it was in the animal's best interest. From seeing the pictures of Maggie, I think she looks horrible. Obviously her lying down for 12 hours is not a sign of good health. Your zoo should do the right thing and find a new home for Maggie. The zoo is sending a very bad message when it sacrifices an animal's well-being for its own gain.